There are a lot of topics in the Holy Scriptures that most church leaders do not want to talk about. Preachers love to tell he story of Balaam the son of Beor. A good show can be made by telling about the evil King Balak, the king of Moab. Seeing what the Israelites had done to the powerful Amorite kings Og and Sihon (both were clearly Nephilim), he figured that he was next. He knew that defeating them militarily was very unlikely, so he turned to the best prophet, soon to be occult practitioner he knew: Balaam. The Torah calls him a soothsayer from the beginning because the town in Mesopotamia named Pethor (Heb. פּתור) means "soothsayer." This suggests that this town, most likely in the Euphrates River valley, was a town loaded with soothsayers. The Hebrew numeric value of the city is 73 x 2 or 686. These numbers suggest that these soothsayers were the best in the world. Since Balak was a rich king, he could afford the best soothsayer money could buy in the best city for soothsayers in the region. It is likely that King Balak also knew that he had the ear of the LORD, something he would need if he was to defeat the Israelites. It took two beckonings before the money got good enough for Balaam to make the trip to Moab. 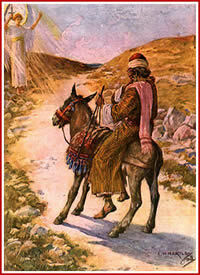 Despite the fact that Balaam was repeatedly told by the LORD not to go, he smelled money, influence, and greater power. He resisted the Word of the LORD and went on, even after the Angel of the LORD withstood him. When he did that, he became a witch because he rebelled against the Word of the LORD (Read I Samuel 15:23 for clarification). When Balaam saw the righteousness of Israel, he knew that the only way to curse then was to bring sin into the camp. While he could not curse them with his prophetic mouth, he could do so with advice. In New Testament times, we find that many people who had prophetic gifts from the YHWH opting to use them to gain money for themselves. Instead of uplifting the Body of Messiah, they sold the spiritual knowledge they received for money, to the highest bidder. II Peter 2 goes to great lengths to expose the nature of these people. We will deal with that another time. The Elder Jude also made a similar illustration in verse 11 of his one chapter book. Clearly, this ties the doctrine of Balaam with the Nicolaitans' doctrine of Antichrist. When money gets mixed up in the equation, even the most godly ministries can be turned into witchcraft-oriented occult ministries that look Christian to most people. They can have all the trappings of Christianity, but when you dig deep, it is not long before you find the evil.